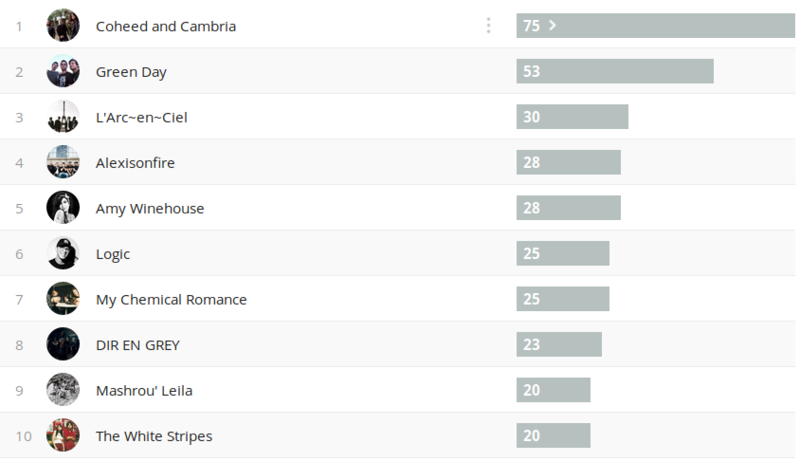 Coheed and Cambria (-) Even though I’ve been making a conscious decision to not listen to as much Coheed and Cambria, I’m still listening to them quite a lot. They’re too good! Vitamin String Quartet (*) This came totally left field. I was looking for In Keeping Secrets of Silent Earth: 3 on Spotify and then I found that this group covered the entire album. When I looked through their discography, they covered a lot of cool alternative/rock/indie bands from the early to mid 2000’s and I went on a huge nostalgia trip. It’s a shame they’re only a quartet, I feel like a lot of the songs would have benefited from an entire orchestra. But yeah. Would recommend. Green Day (+6) I have so much Green Day in my library, I never really noticed. Lately I’ve been putting my library on shuffle and just letting it ride out. Some songs don’t have a lot of draw for me anymore. 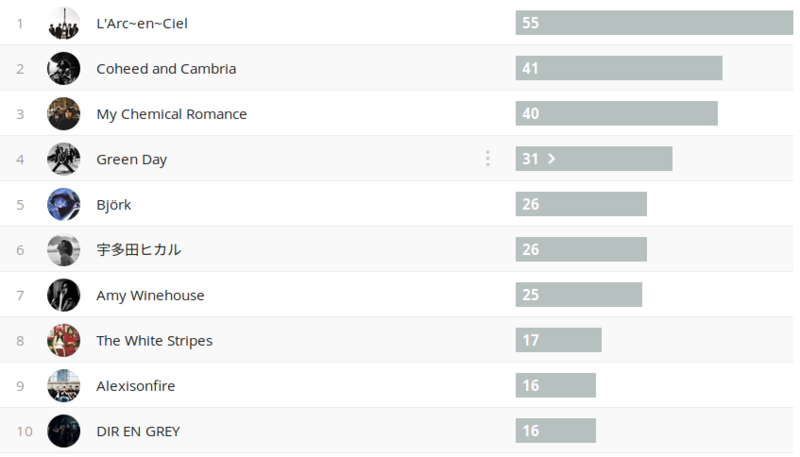 But similar to last week, I am still rocking out to those American Idiot and Nimrod tunes. Thrice (*) Thrice is a long time favourite of mine. I saw one of my friends listening to them on Spotify one day and I just went back and listened to them on repeat for a couple of hours. Amy Winehouse (+2) I don’t know how I overlooked some of Amy’s songs. I still need to listen to her discography. My Chemical Romance (*) This is another case of putting my library on shuffle, I feel. 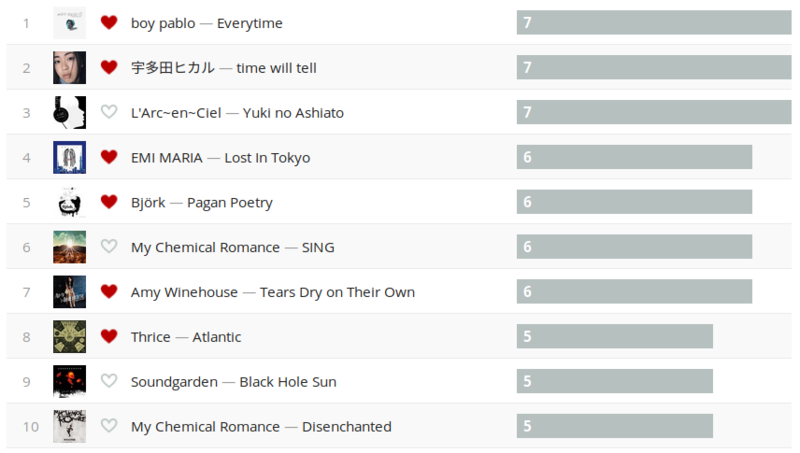 I have so much My Chemical Romance. 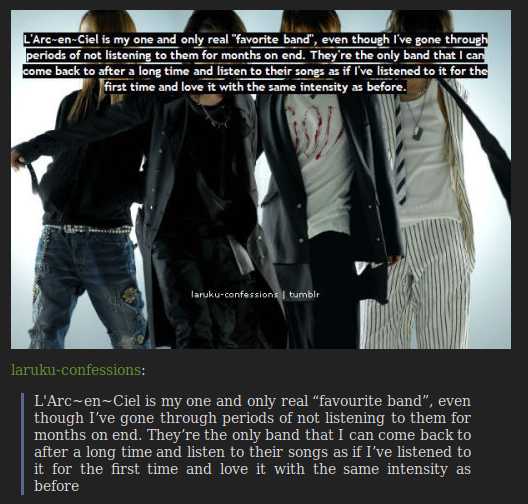 I’m like 99% sure I have their entire discography, bar B-sides and demos and concert versions. Eminem (*) This week has just been pure nostalgia. With Kamikaze coming out, I went on Spotify and saved all the Eminem songs I listened to back in the day. A lot of them from Encore. This was another case of library shuffle and the Spotify algorithm probably picking more Eminem songs because he’s popular. Alexisonfire (*) More nostalgia and more library shuffle! 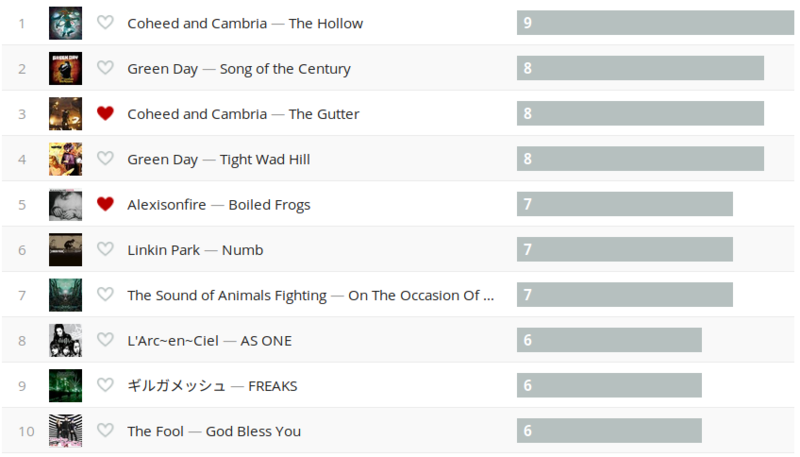 I didn’t notice a lot of Alexisonfire this week. But I do recall rocking out to We Are the Sound a couple of times whenever it came on. It’s hard not to. Joanna Newsom (*) The nostalgia trip never ends. It’s a shame that Joanna doesn’t put her music on Spotify. I have most of her discography anyway (Divers was the last album I bought) and I can listen to it offline on Spotify but it’s still a barrier. Mashrou’ Leila (*) Wow, more nostalgia. Mashrou’ Leila is definitely more recent in my music history but I haven’t picked them up in a couple of months and I totally forgot how they have a bunch of great bops. Coheed and Cambria — Vaxis I: The Unheavenly Creatures (-) I told myself not to overplay this album but I just can’t stay away from it. 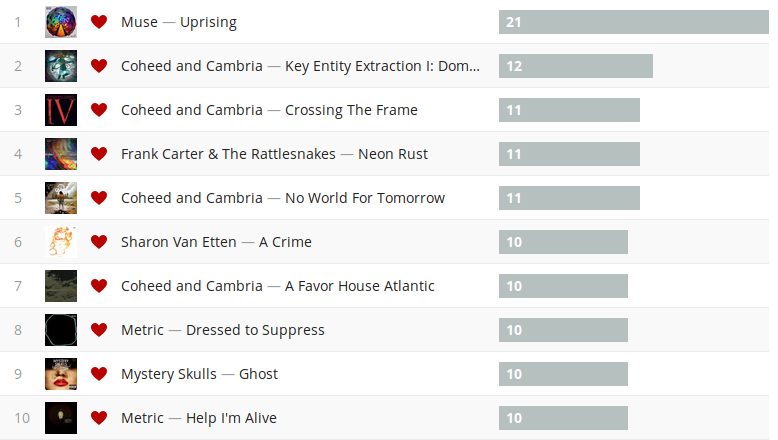 It’s a little weird how no tracks made it into my top 10 songs for this week but that might be a good thing. 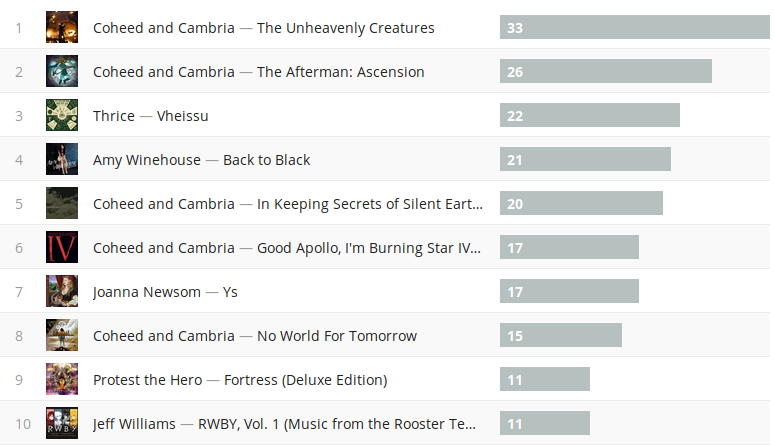 Coheed and Cambria — The Afterman: Ascension (+1) Domino never gets old for me. Every time I listen to it, I can see the music video play so clearly in my head. 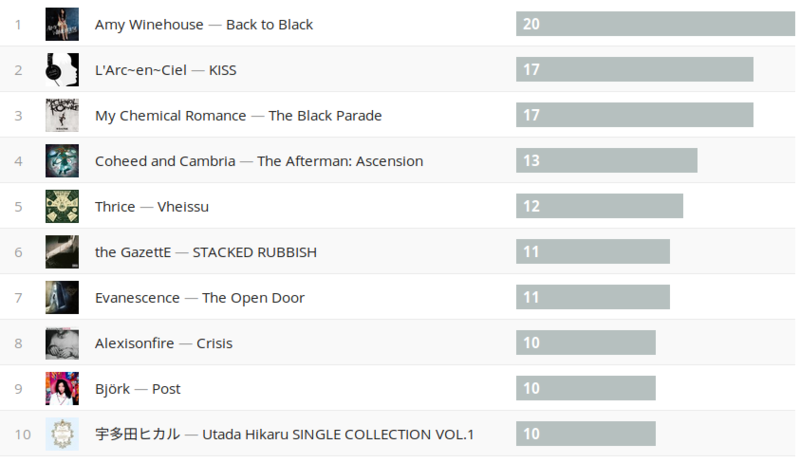 Thrice — Vheissu (*) Vheissu is easily my number one or number two favourite album of all time. There is no track in this album that I don’t like or will ever skip. It’s great from start to finish. Amy Winehouse — Back to Black (+2) Not much to say about this one. Just been listening to a couple of tracks on repeat. 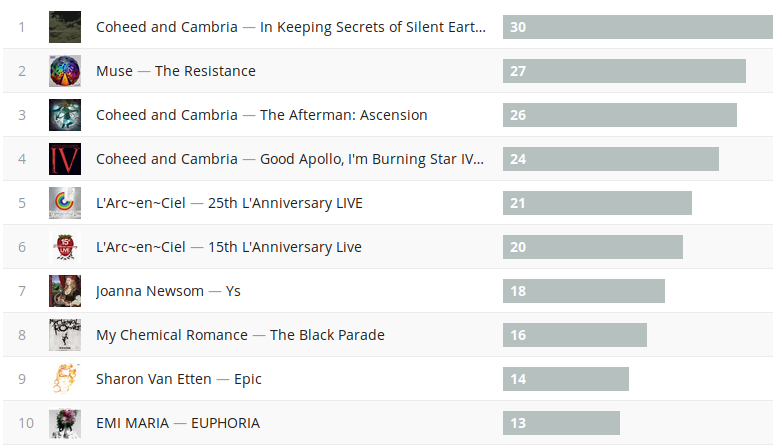 Coheed and Cambria — In Keeping Secrets of Silent Earth: 3 (-3) Definitely slowly winding down on the Coheed. Mostly just listening to A Favor House Atlantic. Coheed and Cambria — Good Apollo, I’m Burning Star IV: Volume 1 (-2) Why is this album so good? Like, seriously. So many good songs on this album. 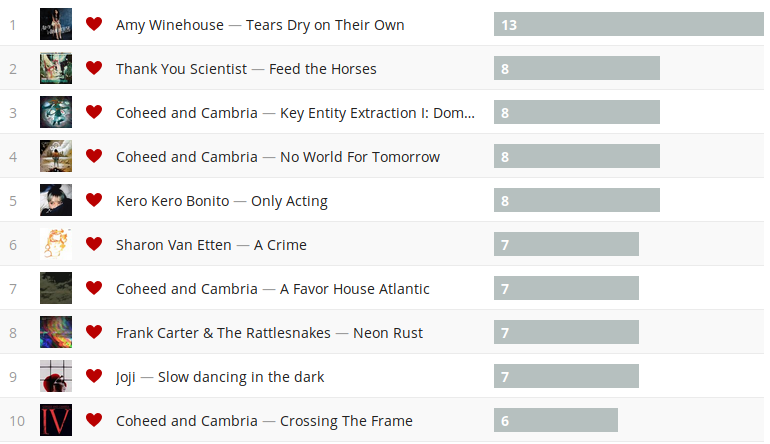 But, still toning it down with the Coheed. 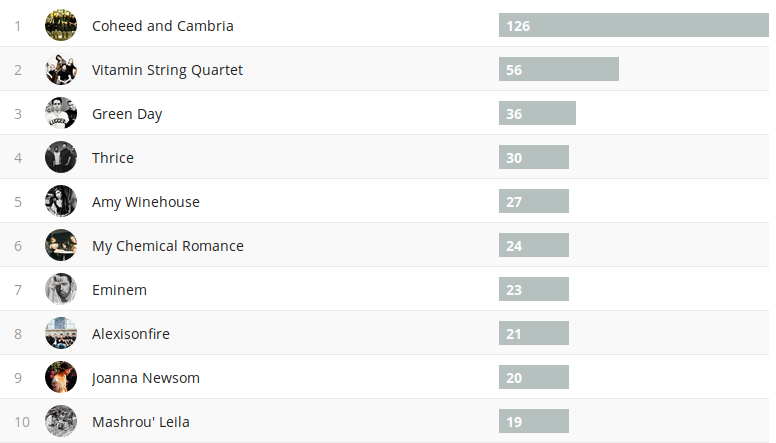 Joanna Newsom — Ys (*) The only reason why Vheissu might be number two instead of number one is because of this album. I love this album. I think it is probably Joanna’s best album. It is a beautifull crafted piece of art. I love it. 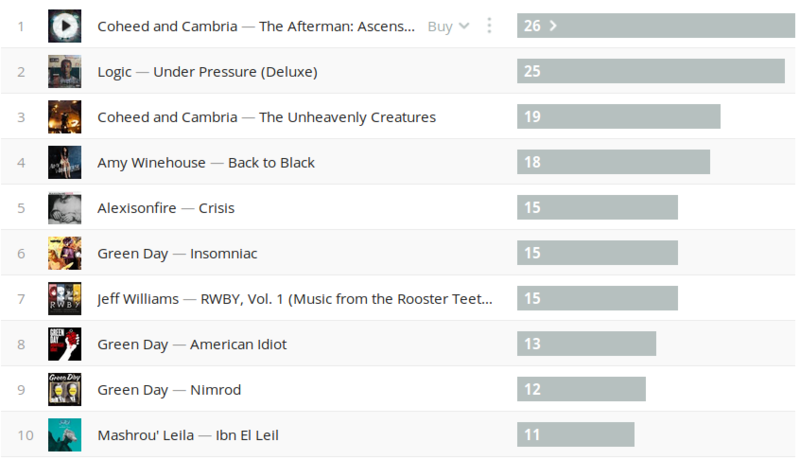 Coheed and Cambria — Good Apollo, I’m Burning Star IV: Volume 2 (*) Was talking to my friend about a couple tracks from this album. It’s pretty underrated, I’m not sure why so many fans are “meh” about it. Protest the Hero — Fortress (*) I was looking for good study music but I didn’t want like strings or lo-fi beats so I tried looking up metal/rock study music. Thank god Protest the Hero released instrumentals for their songs. Surprisingly, a lot of them definitely sound a lot less energetic without vocals. What a difference it makes! Jeff Williams — RWBY Volume 1 Soundtrack (*) RWBY Volume 1 has arguably the best soundtrack in the entire series. This Will Be the Day, Gold, From Shadow, Mirror Mirror, Red Like Roses, I Burn, I May Fall, Wings,… There are way too many good songs on it. The only song that I don’t like from the soundtrack is probably Red Like Roses Part II (just kidding as I’m writing this I’m listening to it now and I like it). Amy Winehouse — Tears Dry on Their Own (*) He walks away, the sun goes down, he takes the day but I’m grown. Oh Amy, thank you for gracing the world with your music. I really think this is a nice and hopeful song. Thank you Scientist — Feed the Horses (+7) Wow, this song went up from last week. It’s a good song but I’m not entirely sure why I keep listening to it as much as I have. Coheed and Cambria — Domino the Destitute (-1) This song is a banger. That is all. 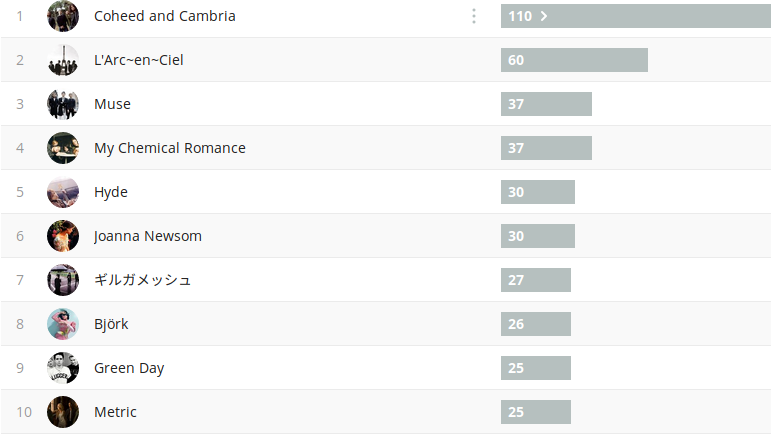 Coheed and Cambria — No World for Tomorrow (*) Probably the best song off of the album. Curse us, as god has. Amazing. I would love to hear this song live one day. 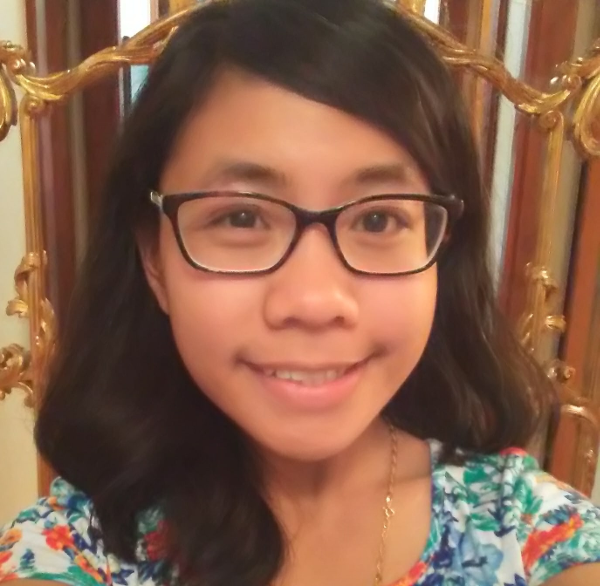 There’s no world for tomorrow, if we wait for today. I remember talking about how In Keeping Secrets of Silent Earth: 3 made me feel like a soldier marching into battle, this definitely takes that concept and amps it up a hundred times. Kero Kero Bonito — Only Acting (-5) Still a good song, just haven’t been listening to it as much. Time to queue it up. Sharon Van Etten — A Crime (+1) I hope I never grow tired of this song because it is beautiful. Coheed and Cambria — A Favor House Atlantic (-2) The other day I looked up the music video for this song. It is so ridiculous but hilarious. They definitely take a jab at Green Day with Claudio dressing up in Billie Joe’s trademark black button up and red tie, it’s so funny. Frank Carter & The Rattlesnakes — Neon Rust (*) I really need to listen to more of their songs because this is a really good song. I just love the atmosphere of the song. The melody in the beginning is really soothing and then it builds up to the chorus. It feels a little empty until the climax but it really releases all the tension in the song. So good. Joji — SLOW DANCING IN THE DARK (-5) Joji. Who hurt youuuuuuu?? Coheed and Cambria — Crossing the Frame (*) Good jam. I’m spying on you Newoooo.